(MoneyWatch) A Senate panel late Monday accused Apple (AAPL) of using what it called a "complex web of offshore entities" to dodge billions of dollars in U.S. income taxes. The technology giant, the world's second-largest company by market value, has used a range of offshore structures, transactions and other arrangements to shield its earnings from taxes, said the U.S. Senate permanent subcommittee on investigations in a report. Among its other tactics, Apple allegedly established an offshore subsidiary, Apple Operations International, that from 2009 to 2012 filed no corporate income tax return despite reporting net profits of $30 billion. Apple paid only 1.9 percent tax on earnings outside U.S. Lawmakers also said that a second Irish affiliate of the company, Apple Sales International, paid only a "tiny fraction" of income taxes on $74 billion in income it generated over four years. "Apple wasn't satisfied with shifting its profits to a low-tax offshore tax haven," said Sen. Carl Levin, D-Mich., who chairs the panel, in a statement. "Apple sought the Holy Grail of tax avoidance. It has created offshore entities holding tens of billions of dollars, while claiming to be a tax resident nowhere." The subcommittee will hold a hearing Tuesday on companies' offshore tax avoidance that will highlight Apple's practices. Witnesses will include Apple CEO Tim Cook and Treasury Department officials. 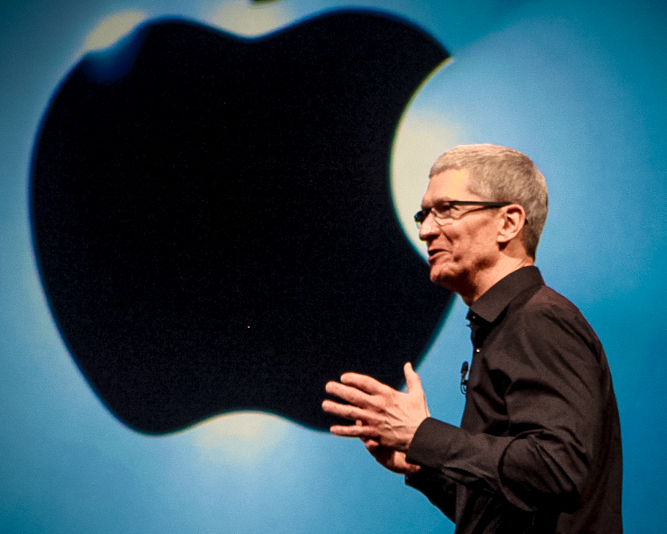 Cook is expected to present the company's case for overhauling corporate taxes. "The company supports comprehensive tax reform as a necessary step to promote growth and enable American multinational companies to remain competitive with their foreign counterparts in both domestic and international markets," Cook said in prepared remarks. Apple shares closed up over 2 percent at $442.92 Monday. The stock was down less than 1 percent in after-hours trading. In its latest quarter, Apple reported net income of $9.5 billion, down from $11.6 billion in the year-ago period, on sales of $43.6 billion. U.S. multinationals have faced increasing scrutiny in recent years over their tax practices. The Senate permanent subcommittee said last year that Hewlett-Packard (HPQ) and Microsoft (MSFT), among other companies, shifted assets to overseas subsidiaries to reduce their tax liability. They also have taken heat for keeping profits overseas, rather than expanding in the U.S. and otherwise investing in their domestic operations. For their part, corporate leaders have long pressed for a "tax holiday" on companies' overseas profits, arguing that lower rates would encourage businesses to boost hiring in the U.S. As of the end of March, Apple had roughly $100 billion in earnings parked abroad.